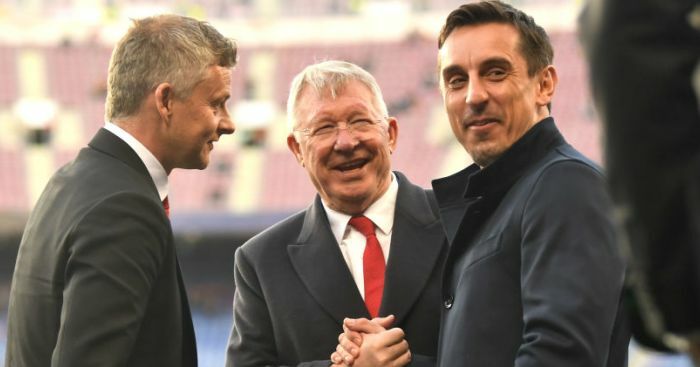 Gary Neville believes Ole Gunnar Solskajer needs a whole new defensive line after Manchester United were humbled by Barcelona on Tuesday night. It was United’s fifth defeat in seven games, but it was the manner of the defeat which has set alarm bells ringing as United were outclassed losing 3-0 on the night and 4-0 on aggregate. Solskjaer has admitted he faces a “rebuilding job” but he knows he will have to work hard to do “clever business” with United not the lure they were under Sir Alex Ferguson. And after Lionel Messi inspired Barcelona with two goals on the night to send the Red Devils crashing out of Europe at the quarter-final stage, Neville was blunt in his assessment of a back four which included Victor Lindelof, Phil Jones, Ashley Young and Chris Smalling. He told beIN SPORTS: “The coaching staff will see there’s a massive gulf between Europe’s best teams and where Manchester United are at. Manchester United need to revamp their squad – there is no doubt about that.